Once again, Orange County hosted thousands of fans at Camping World Stadium for the 2019 Florida Blue Florida Classic on Saturday, Nov. 17 for the much-anticipated rivalry game between Florida A&M University (FAMU) Rattlers and the Bethune-Cookman University (BCU) Wildcats. The Florida Classic is the largest football game between two historically black colleges in America, surpassing the Bayou Classic as the top attended game in the NCAA Division 1-AA. Since 1978, the game has seen more than 1.9 million fans in attendance. The Bayou Classic is the annual college football game between the Grambling State University Tigers and the Southern University Jaguars, first held under that name in 1974 at Tulane Stadium in New Orleans. The Orange County Board of County Commissioners (BCC) supports the Florida Classic by awarding $500,000 to the Florida Classic Consortium. The funds generated from the game ultimately helps to provide scholarships for students attending FAMU and BCU. The consortium receives the funds annually and consists of several members from both institutions including the presidents and athletics directors. Camping World Stadium, formally known as the Orlando Citrus Bowl, reopened in 2014 as part of a $94.5 million venues package. This venue has transformed our community into a mecca of economic, cultural and sporting events that enhances the region’s increasingly diverse and creative population for generations to come. Since construction in 1936, Camping World Stadium has hosted numerous outstanding athletic events, including the NFL Pro Bowl, WrestleMania, FIFA World Cup, and many high-profile college and bowl games. The stadium has also held star-studded performances from iconic artists, such as the Rolling Stones, Aerosmith, the Eagles and Jay-Z and Beyoncé. In Jan. 2019, Camping World Stadium will continue its tradition of hosting signature events, including the annual Citrus Bowl, Athletic Bowl, Pro Bowl and Monster Jam. 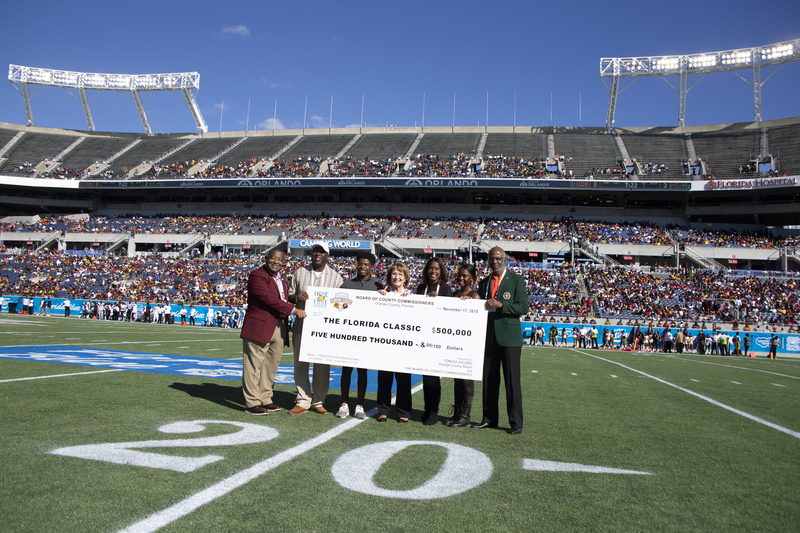 Photo Caption: Orange County Mayor Teresa Jacobs and District 6 Commissioner Victoria P. Siplin join leadership from Florida A&M University and Bethune-Cookman University to award the Florida Classic Consortium with $500,000 on behalf of the Board of County Commissioners at the Florida Blue Florida Classic game on Nov. 18, 2018 at Camping World Stadium.